BELGRADE, Sept. 2 (Beta) - Serbian President Tomislav Nikolic on Sept. 1 described Serbian-Canadian relations as excellent to Canadian former Minister of Forin Affairs John Baird, but said economic cooperation was in need of much improvement as Serbia had many opportunities to offer to Canadian investors. 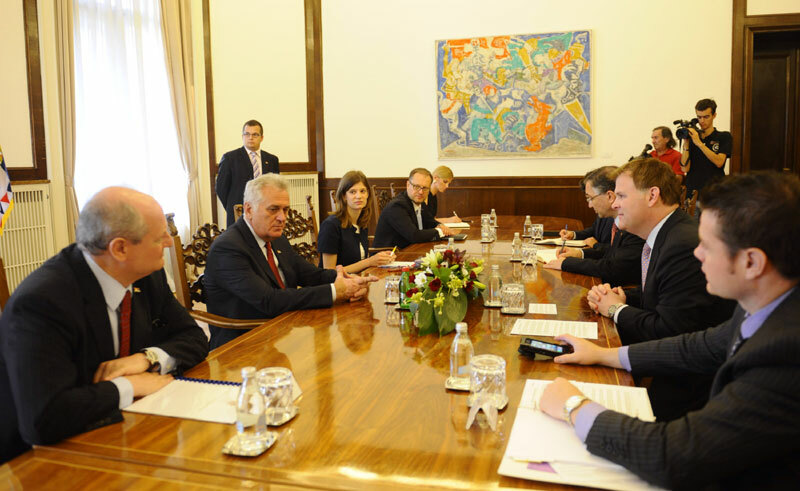 Baird also voiced a desire to bolster the two countries' bilateral ties, especially economic, stating that Serbia offered huge potential to Canadian investors, particularly in the fields of mining and pharmaceutical production, Nikolic's office announced. Nikolic said Serbia had taken a principled stand on the Ukrainian crisis and that there would be no sanctions against Russia, but noted that Belgrade respected the territorial integrity of Ukraine. On the topic of Ukraine, Baird stressed that it was his country's firm position that it was unacceptable for one man to wage wars in Europe in the 21st century. He also stated that Canada was looking forward to Serbia's chairing of the OSCE in 2015 and was certain that it would be a success.